Different and delicious! 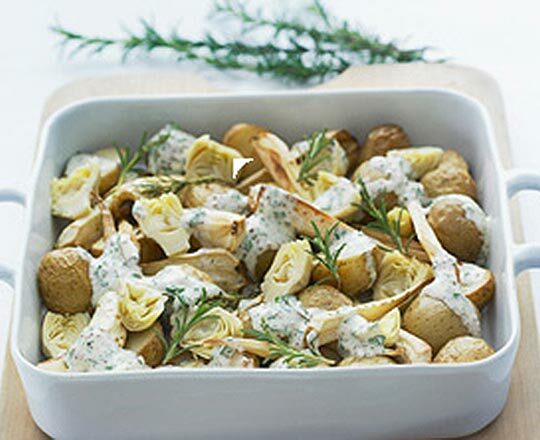 Warm Potato, Parsnip and Artichoke Salad with Philadelphia Light Spreadable Cream Cheese. COMBINE potatoes, parsnips, oil, rosemary and seasonings in a large bowl and toss to coat. Place on a lined baking tray and bake in a very hot oven 220°C for 25–30 minutes or until tender. Place on a serving platter and toss through the artichokes. WHISK together the PHILLY, honey, milk and mustard until smooth. Stir through the parsley and drizzle over the vegetables. Garnish with rosemary. Serve immediately. HANDY TIP: For a main course salad, add 400g sliced smoked chicken breast before serving.